Summary: Zoe Whittaker is living a charmed life. She is the beautiful young wife to handsome, charming Wall Street tycoon Henry Whittaker. She is a member of Manhattan’s social elite. She is on the board of one of the city’s most prestigious philanthropic organizations. She has a perfect Tribeca penthouse in the city and a gorgeous lake house in the country. The finest wine, the most up-to-date fashion, and the most luxurious vacations are all at her fingertips. What no one knows is that five years ago, Zoe’s life was in danger. Back then, Zoe wasn’t Zoe at all. Now her secrets are coming back to haunt her. As the past and present collide, Zoe must decide who she can trust before she—whoever she is—vanishes completely. The Vanishing Year combines the classic sophistication of Ruth Rendell and A.S.A. Harrison with the thoroughly modern flair of Jessica Knoll. Told from the point-of-view of a heroine who is as relatable as she is enigmatic, The Vanishing Year is an unforgettable new novel by a rising star of the genre. Holy smokes Batman! Zoe’s story kept me on the edge of my seat! Ok.. this one is going to be hard to talk about without getting into some spoilers- so allow me to dance around a bit of the real WHY you should read this book and give you some non-spoilery whys! Because Kate Moretti is awesome-sauce. And the reveal. When all the WHYS of why this book happened, you will love. 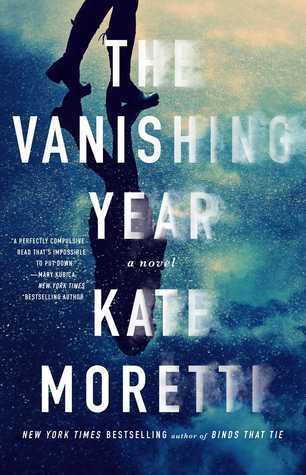 I loved how the story of Zoe flipped from present to her past and how when you just thought you might have Kate Moretti figured out- she zings something past you that has you reading faster to see what happens next. Bottom line: If you are looking for something suspense-y, you’ve met the right book. Oooh, sounds like my kind of book! I love the cover and am ready for some more thrillers! Adding it to my TBR list. Thanks! YAY!!! Psst… Rhiannon at Ivory Owl Reviews has a 3 copy giveaway happening. Just FYI! It so can. It was def a good read and one that I think you might like!